All kinds of Electrical Heating Elements, Temperature Controllers, Sensors, Fiberglass Wires. To heat up dies & moulds, where uniform & quicker heat is required, and where more surface are to be covered. To heat dies & moulds, where temp above 400C. is required (max. upto 450C. ), more surface area to be covered & quicker heat is required. Basically this heater is tubular type, with higher watt density & covers & being casted in aluminum & m.s. it renders long life & covers. Basically this is a tubular type heater with higher watt density. 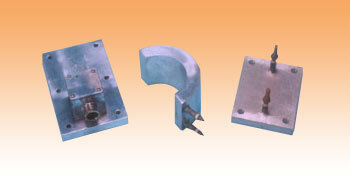 It is casted in aluminums alloy to suit required shape with fixing holes. It has terminals at opposite side of the heated surface.